There are all times when we want to send a positive vibe to somebody. This could be a member of your family, a friend or somebody you know through work. The first 2 are easy; you give them a hug and tell them, the latter? Not so easy. Many of us come into contact through our work that we get to know on a impersonal basis. Granted, many close friendships are formed in the workplace but we are concentrating on those you know to say hello to, or have a coffee with at break time. The solution; these awesome Positive Thinking corporate ecards. 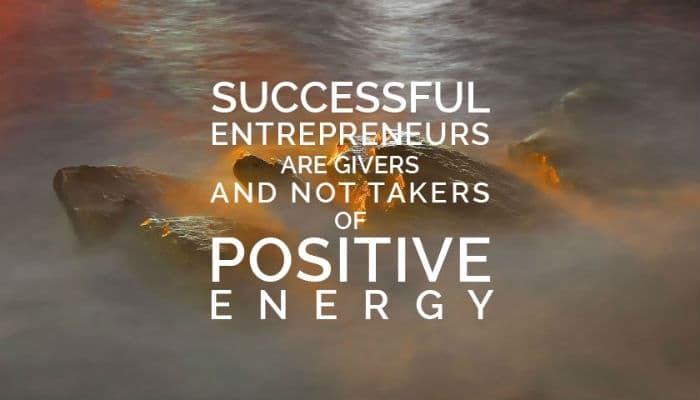 Featuring an image of rocks rising from a swirling ocean, the text sends out a very powerful message; “Successful entrepreneurs are givers, and not takers, of positive energy”. This can be interpreted in several ways, but we like to think of it in a pay it forward sense, where you offer a positive vibe to someone who passes it on to somebody or something. Whichever way you look at it, they’re pretty cool ecards to have pop into your inbox, especially as you can personalise it with your own message to let them know your take on things. If you think these ecards are cool you had better go and see what the fuss is about with our electronic Christmas cards for business. They really are amazing value and impact for your business.